Located inside the Jenni K. retail store is “The Gallery”, which showcases one-of-a-kind, custom designs centered on precious gemstones. These unique pieces have been individually designed to bring out the deep natural splendor of each stone. 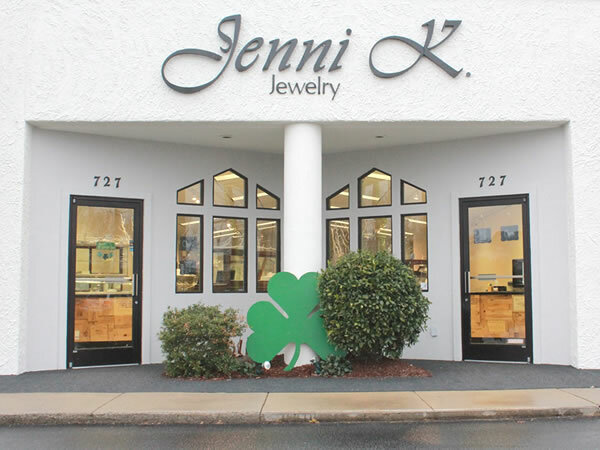 And with the growth in popularity of Jenni K. Jewelry, their facility has grown too. In order to serve her clients better, Jenni K. has released a new re-vamped website with new handcrafted jewelry designs in 2015. On the website, you will find an abundance of handmade jewelry from handmade silver rings to jewelry for the little ones in your life with Baby K Jewelry. Jenni K. designs are protected under US Copyright Law, and is a registered trademark of JKL, Inc. I started making jewelry when I was 13 years old. I began designing simple, elegant jewelry – each piece handcrafted with care to be unique and distinctive as the person wearing them. I dreamed of owning my own store. I perfected my craft and graduated from East Carolina University with a bachelor of fine arts degree in Metalsmithing. As my designs grew in popularity, I decided to open the first Jenni K. store in my college hometown of Greenville, North Carolina. I never dreamed my jewelry would captivate so many that it would be worn across the entire country. Although I have been featured on QVC and my designs have become known nationwide, the spirit of Jenni K. Jewelry remains the same. I still love to create. I’m inspired to design distinctive jewelry in sterling silver, 14K gold, gold-filled, copper, and a combination of metals that are fun and easy to wear. I also continue to take great pride in the craftsmanship of our jewelry, which is why every piece of jewelry comes with a lifetime guarantee against manufacturing defects. I hope you will enjoy your Jenni K. Jewelry as much as I enjoy bringing it to you.